If your appetite for Cortot�s master-classes was whetted by hearing his poetic elucidation for a student of Kinderszenen�s romantic byways then you will be truly swayed by this three CD set. It enshrines over three hours of Cortot�s master classes at the conservatory he�d founded in 1919, the �cole Normale de Musique, and was taped over the course of six or seven years by a student of engineering, Pierre Thouzery. What we have are Cortot�s own performances and his comments on his students� playing and on the works in general. I say �performances� but I should strongly qualify that by noting that, as with any teacher, Cortot plays in response to a student�s performance and that the results are often fragmentary. They�re certainly not to be taken as concert performances. Nevertheless there are some additions to Cortot�s discography here not least in the form of the Bach Partita. These are of considerable significance to admirers, notwithstanding the inevitably partial nature of the performances. Perhaps though, if anything, it is the contextual nature of the music making that will be the most important nature of these discs; the opportunity to hear Cortot�s eloquent and imaginative discourse upon the music and approaches to it. These, of course, are in French but full English translations are provided. Laced through the poetic and philosophic reflections are humorous asides � a blast of Paganini thrown in to amusing effect or an aside as to unnamed contemporaries. Listen to him, for example, when discussing the A major Mozart Sonata K331 (300i); �I cannot stand the way some great Italian artists play [demonstration follows] No, no, it must sound natural [demonstration].�� Naturally we conjecture as to unnatural sounding Italian Mozartians � Michelangeli? In the alla Turca finale of the same sonata he enjoins the student to be �more biting.� Whilst he describes the slow movement of the A minor sonata K310 as �like a lied of Schubert� � and plays it with appropriate songfulness. What emerges forcibly is his narrative involvement in these works and that is at its most acute in Schumann and in Chopin. The Mazurkas and Preludes constantly invoke words such as �meaning� and �pain� and for all the questions of rhythmic emphases and dynamics and balancing (�much too loud� he complains of a student performance of the C minor Prelude) we remember most his comment on the later Chopin�s �sickly nostalgic mood� in relation to the Fourth Ballade. One of the prime movers behind the project was Murray Perahia and his booklet comments are extremely instructive, his determination to see the project to completion admirable. The constituency for this three CD set will be limited, doubtless, but that makes it even more valuable. 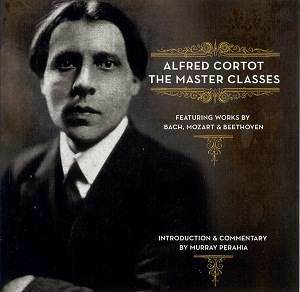 If you want an insight into Cortot�s methodology, his approach to music making and to teaching, you will find this set fascinating. Acknowledging that his playing is related to the specific circumstances of a master class one can still admire much, especially the terpsichorean Bach Partita, the driving Chopin Scherzo, the infectious lift of some of the Mazurkas and his intense Beethoven. It is an important document, no question, of a psychologically acute teacher who fused the practical with the poetic and never shied away from questions of the heart, and the soul.